What is best? – Laser or Object Plane? 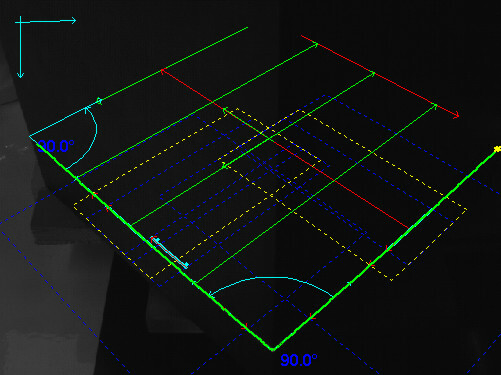 We work hard to establish Scorpion Vision as a premium software solution for 3D laser triangulation. Scorpion ability to calibrate multiple triangulation system together is very important to do two-sided or N-sided laser triangulation. The image below shows how the calibrated laser triangulation reference systems stand out perpendicular to the conveyor. It shows that laser triangulation is real 3D and the superiority of the Scorpion reference systems. How can we do this: We calibrate in the Object Plane – we believe this is the best option if you need easy recalibration and focus on accuracy. More information about getting started with Scorpion on Scorpion Vision Online. Read more about the actual hw and sw setup.